Most common allergens must be declared on the food label if they are included as an ingredient in a food. Precautionary allergen statements are voluntary. Some individuals are extremely sensitive and even trace amounts of a food can cause allergic reactions. soybean. Example of how food allergens are often declared on a food label. While gluten (not wheat) must also be declared on the label, you need to be careful to avoid all wheat ingredients (not just gluten) if you have a wheat allergy. If a severe health risk is posed by an allergen, the Food Standards Code also requires a warning statement on food packaging. For example, a food containing the bee product royal jelly may cause severe allergic reactions, particularly if you have asthma or an allergy. What about precautionary allergen statements? 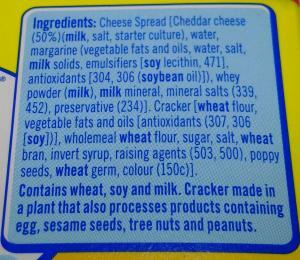 Some labels include “may contain (allergen)” statements, for example, may contain traces of peanuts and tree nuts. Manufacturers may add these precautionary statements to food labels if there may be traces of the allergen present. This may be due to shared equipment or cross contamination in the handling or storage of ingredients. It is important to note that precautionary allergen statements are voluntary (external site). Some individuals are extremely sensitive and even trace amounts can cause allergic reactions. If a precautionary allergen statement is used, schools and child care services should not give the food to students with a known allergy to that food, unless permission has been given by the parent or guardian. Please note: This is not a complete or comprehensive list of ingredients to avoid but is intended as a helpful aid. It is not meant to replace medical advice. Any product containing the word milk from an animal source must be avoided, for example goat milk. Note: Lactose does not normally contain the protein that causes reactions, but there may be a risk of contamination with milk protein. Lactose found in medication is generally safe. Food Standards Australia New Zealand (external site). Some individuals are extremely sensitive and even trace amounts of a food can cause allergic reactions including anaphylaxis.